The Desperate Revival is a story-arc that appeared in both the manga and the anime. In the anime, the arc consisted of episodes 188-193. In the arc, it's apparent that Ran once again comes to the conclusion that Shinichi and Conan are the same person, and after Conan is shot by a group of thugs in a cave, he decides to tell her the truth. However, with the help of Heiji and Haibara, he is able to convince Ran that Conan and Shinichi are not the same. Plus, Haibara has created a prototype antidote for him, and he is now Shinichi! However, the antidote does not last long, and leads to heartbreaking results in the life of Shinichi and Ran. Ran is practicing for her princess role in a play that Sonoko wrote for their campus festival. Conan and her father object to who her partner is for the said play since she had to kiss someone. Just as Ran decides to take a quick shower for her practice, she is told that the shower is broken. Conan also wanted to take one so he asks Ran if she wants to go with him to Professor Agasa's house and take a shower there. When Ran comes over, Haibara goes to the basement for some important research and says she doesn't want to be bothered by anyone. Later, the Detective boys go to a camping site and find a limestone cavern. The gang decides to explore the cavern and Genta discovers a corpse and people disposing of it. Thanks to the Detective Boys' curiosity, they discovered three robbers who tried to hided the corpse of the fourth member inside the cave. One culprit notices them so he shoots and seriously wounds Conan. As soon as the thieves notice the children, the leader shot Conan in the stomach! The Detective Boys search for an exit while running away from the culprit, and they managed to outrun them, but get trapped in a dead end passage. They hear from the murderers that there is one exit, but all the other passages in the cavern are dead ends. The branches are arranged in an unusual fashion and their is a strange pedestal with a round shaped stone on it. Conan passes out from his injury, but manages to relay a final hint to the detective boys on which passage to take. The Detective boys figure out the caverns are names for Shogi pieces from Conan's hints, the layout, and trial and error. They use their detective badges to attract bats and distract the man watching for them. They flee down the correct path, but the suspects catch up and threaten to kill them. Luckily Haibara and Agasa informed Megure who has the cave surrounded. Two of the culprits give up, while the other one takes Conan hostage at gun point. Conan tranquilizes him. As they rush the wounded Conan to the hospital, he is in need of a blood transfusion. Ran immediately offers her blood saying she has the same blood type as Conan does, and he thinks Ran already knows he is Shinichi. Recovering in the hospital from his bullet wound, Conan contemplates telling Ran his true identity, since, Ran was already certain of who he was as she knew Conan's blood-type when she donated her blood, the same as Shinichi's. Additionally, Heiji and Kazuha drop by to visit him and Heiji warns him that it's best to be true, so he should tell Ran everything. But Ai Haibara shows up and points a gun at him. She reveals that the Black Organization knew of her real identity and betrayal, but were willing to re-recruit her, as long as she kills Conan as well as the people who know who he is: his family, Agasa, Ran and Heiji. Ai Haibara points a gun at Conan. Ai fires her gun... and it's a toy one, whose "bullets" are flowers. She places them inside a vase and, as she does so, she says the B.O. would never let her live after her betrayal and adds she wouldn't betray Conan and Agasa anyway. She reveals that she actually wanted to see if they would've acted similarly in such circummstances. 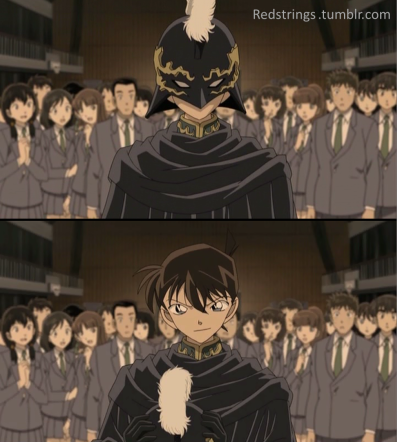 She then warns Conan of the dangers of him revealing his identity to Ran, now that she has leads to know that Conan to be Shinichi, and states that Conan has three choices; 1, he continues coldly not revealing his identity, 2, he reveals his identity to Ran and hopes that the Black Organization doesn't discover them... and the third option is not revealed. During the play Ran's "princess" is abducted by bandits (causing Kazuha, who is in the audience, to start screaming at them to leave her alone), but then she's saved by the Black Knight. Said knight has his face shrouded, so at first everyone thinks it's Araide, but the Black Knight appears to go off script embracing her and is about to kiss her, much to the horror of Kogoro... but the romantic scene is disrupted when a man in the audience falls dead, seemingly by potassium cyanide poisoning in a drink. Kohei Kamata died from poison in his own drink. The Black Knight reveals his identity to be Shinichi. Shinichi reveals that the poison was placed in the ice cubes and that Kamata had a habit of eating ice. He reveals the murderer to be Kamata's friend, Mai Kogami. Shinichi explains that Mai kept the ice cubes in a little purse which was kept cool through dry ice. Mai says that she bought the same drink as Kamata and that there was only a fifty percent chance that he would take the drink with the poisoned ice cubes. Shinichi explains she put ice cubes in both drinks and that after emptying her drink, she placed the poisoned ice cubes in her hood evidenced when a 10 yen coin undergoes a chemical reaction with contact to her hood. Mai confesses and explains that Kamata murdered his patient in order to have his medical thesis published. Shinichi collapses after solving the case and wakes up and realizes he still retains he is still Shinichi and has not regressed back to Conan. The next day, Shinichi takes Ran to a fancy restaurant in order to confess his love. Meanwhile, a man named Satoru Ooba kisses his girlfriend. When the elevator opens up behind her, he shoots and murders, Taiji Tatsumi, his boss and his girlfriend's father. Before Shinichi could confess, he investigates the murder and realizes Ooba is the murderer. Conan says the words of Shinichi to Ran. Shinichi confirms Satoru Ooba to be the murderer and reveals that he used a glove and plastic bag so his clothes would not be stained with gunpowder. He reveals that the plastic bag was hid in a mascot costume and that it contains Ooba's fingerprints. Ooba counters stating that his co-workers also touched the plastic bag. Shinichi reveals that Ooba confessed to the crimes also since he said his girlfriend's earrings were pink yet color is not distinguishable in the dark and thus reveals that Ooba was with his girlfriend when the elevator doors opened. Ooba confesses and reveals that his father's company was destroyed by Tatsumi and prompted his father to suicide. Shinichi, who has resoved the case despite being under the effects of the cure wearing off, escapes to the bathroom and regresses back to Conan. Ai, who is still masquerading as Conan, shows up and tells him the time limit is almost over, and she returns him his smaller clothes. When Ran calms down, both she and Conan eat ice-cream together. Ran asks Conan if Shinichi told him what's that "important thing" he wants to tell her and then rants about Shinichi taking her to this expensive restaurant for "nothing important", and Conan blushes and thinks to himself that this is the place where his dad proposed to his mom. Conan is shot and is given a blood transfusion by Ran. Ran thinks Conan is Shinichi. In order to alleviate Ran's suspicion, Haibara gives Conan the first temporary antidote to APTX 4869 so he can become Shinichi while she takes up the role of Conan so they can both appear at the same time. Ran is fooled. Shinichi tries to confess to Ran at the place Yukiko and Yusaku proposed, but fails to do so before he turns back into Conan. The Wounded Great Detective: When thinking over whether to tell Ran his secret, the manga version of Shinichi recalls his parents' parting words from The Cornered Famous Detective! Two Big Murder Cases. The anime omits that scene. The Third Choice: In the anime, after it's revealed that Shinichi is really Heiji, Megure made a comment about how they don't need anyone else showing idiotic behavior like Kogoro (prompting an annoyed stare by Kogoro, with Megure passing his comment as a joke). The melody of the song that Ran sings in the shower is "Secret of my heart" by Mai Kuraki. The thug shot Conan in the back; however, he was shown to be injured in the front. 'Shuffle Romance' is the name of the play in which Ran participated. In Episode 188 (file 251), Haibara has the bloody disk of copied APTX 4869 data from Reunion with the Black Organization. She had lied to Conan about losing it. Gosho designed the Black Knight's helmet to look like Char Aznable's helmet. Gosho is a fan of the Gundam series. Conan's comment about Agasa remembering tent is a reference to "The Old Blue Castle Investigation Case". A large portion of the episode's finale segment was later used for the song Kimi e no Uso, the closing song for the series' 24th season. * Haibara, when holding Conan at fake gunpoint, faked a story that after the Haido City incident, another Black Organization member started tracking her and found out her secret identity. They located Haibara and demanded her to kill Conan as the condition to return to Black Organization. It turned out the subsequent story line unfolded almost exactly as in Haibara's fake story, but Vermouth, who tracked down Haibara, would kill her rather then leave her a chance to return to Black Organization.